Last major update issued on May 2, 2005 at 02:40 UTC. The geomagnetic field was quiet to major storm on May 1. 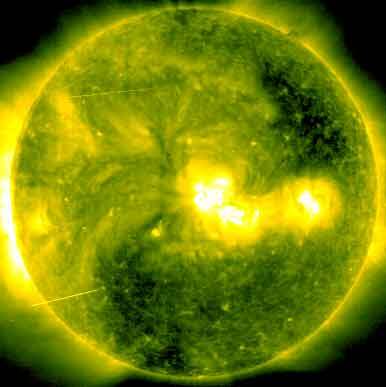 Solar wind speed ranged between 528 and 705 km/sec under the influence of a high speed stream from CH162. Solar flux measured at 20h UTC on 2.8 GHz was 111.6. The planetary A index was 26 (STAR Ap - based on the mean of three hour interval ap indices: 26.3). Three hour interval K indices: 56433332 (planetary), 55433332 (Boulder). At midnight there were 2 spotted regions on the visible solar disk. The solar flare activity level was low. A total of 2 C class events was recorded during the day. A fairly active region behind the southeast limb was the source of both events, a long duration C1.9 event peaking at 16:38 and a long duration C2.1 event beginning on May 1 and peaking at 00:04 UTC on May 2. Region 10756 decayed slightly and became more compact. An M class flare is still possible. Region 10757 decayed losing several small spots. April 29: No obvious fully or partly Earth directed CMEs were observed. April 30: A faint full halo CME was observed in LASCO C3 images beginning at 17:18 UTC. No obvious frontside activity was observed during the hours before this, and the source was likely backsided. May 1: A brighter full halo CME was observed in LASCO C3 images beginning at 01:42 UTC. Considerable large scale reshaping of the corona to the south of region 10756 was observed late on April 30 and early on May 1. However, since I couldn't observe any significant eruptive event or a disappearing filament during the relevant time frame, it is at this time uncertain if the CME was backsided (with the same source as the CME observed on April 30) or had its origin near region 10756. 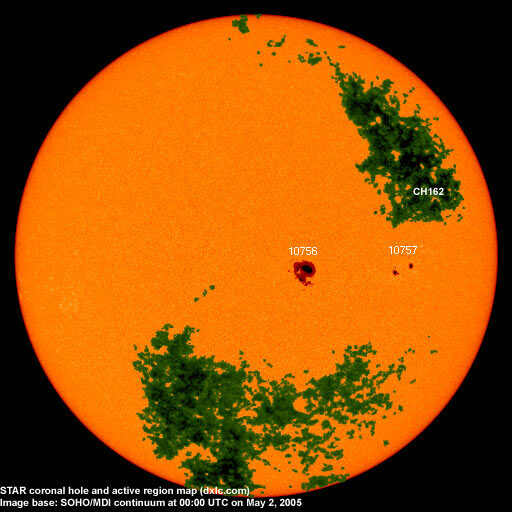 A recurrent coronal hole (CH162) in the northern hemisphere was in an Earth facing position on April 27-29. The geomagnetic field is expected be quiet to unsettled on May 2-4. If the CME observed early on May 1 was caused by activity on the visible disk, a CME impact will be possible on May 3. Long distance low and medium frequency (below 2 MHz) propagation along east-west paths over high and upper middle latitudes is very poor. Propagation along long distance north-south paths is poor to fair. Trans Atlantic propagation conditions are normally monitored every night on 1470 kHz. Dominant stations tonight: Radio Cristal del Uruguay and Radio Rafaela (Argentina). The strongest trans Atlantic signal noted was from Radio América (Argentina) on 1190 kHz.